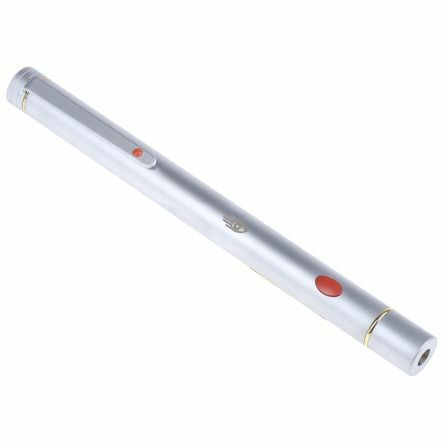 Slim-line pen style pointerAttractive matt-silver casingRed on/off buttonRed laser dot can be turned into an arrow by twisting the laser headIncludes 2 x AAA batteries. 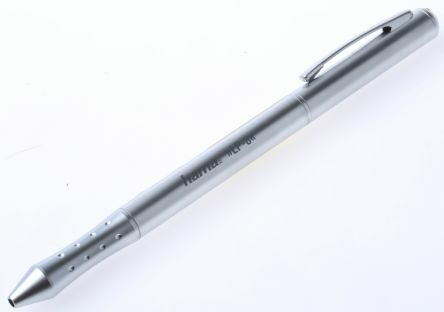 Laser pointer + LED + pen + PDA stylusMetal housingRange: 50 mWavelength: 640 → 660 nmLaser class 2Incl. LED lamp, colour: whiteIncl. PenIncl. PDA stylusFor 4 x LR-41 batteries (supplied)Dimensions: 150 x 10 mmWeight: 27 g (without batteries)CE-approved. Green laser beam (much lighter than red laser pointers)Metal housingRange: 50 mWave length: 540 nmLaser class 2Dimensions: 122 x 13 mmWeight: 160 g (without batteries)Power supply: 2 x R1 N batteries (supplied).